Bruckner, Bruckner, wherever one goes; From Salzburg to London, he is with us, he is with us indeed, and will be next week too. (I shall even be given the Third Symphony another try, on my birthday: the things I do for Daniel Barenboim…) Still, at least it seems to mean that fewer unnecessary Mahler-as-showpiece performances are being foisted upon us. Moreover, in this case, it was good, indeed great Bruckner, rather than one of the interminable number of ‘versions’ of interminable earlier works. Keen though I was to hear the Gustav Mahler Youth Orchestra in Bruckner’s Ninth Symphony, for he principal attraction for me, and for a good part of the audience, was in any case the extremely rare opportunity to hear a Bach cantata played by mainstream performers – especially, so it seemed, when the soloist was Christian Gerhaher. According to the programme, there had only been two previous such opportunities to hear Ich habe genug at the Proms: in 1956 and in 1962, with Heinz Rehfuss and Hermann Prey as soloists, both enticing prospects indeed. Ian Bostridge performed the version for high voice (with flute obbligato, rather than oboe, and period instruments) in 2000. As it was, Philippe Jordan, heedless of the size of the hall, opted for a very small orchestra (oboe, strings 6.4.3.2.1, chamber organ) and, perhaps more to the point, insisted throughout that the strings play in very subdued fashion. An advantage of smaller forces can often be a greater willingness to play out, but not here. It is a reflective work, of course, and does not need to sound like Mahler (or Bruckner), but the approach nevertheless seemed perverse; I can imagine it might have worked better on the radio. The opening aria was taken at a ‘flowing’ tempo, which is to say considerably faster than would ‘traditionally’ have been the case. On its own terms, it worked well enough, but memories of, say, John Shirley-Quirk with Neville Marriner, or Dietrich Fischer-Dieskau (with various conductors) were anything but effaced. Gerhaher’s use of head-voice, moreover, left this listener at least longing for something deeper, darker. There was certainly greater resolution, though, upon the da capo. His diction, whether in arias or recitatives, was impeccable. Bernhard Heinrichs’s oboe playing was unfailingly musical, very much a second ‘voice’. ‘Schlummert ein’ was again relatively swift, although I felt Gerhaher might have done more with the words without coming anywhere near over-emphasis. And Jordan’s pauses seemed excessive: disruptive more than anything else. The following recitative offered much more in the way of verbal emphasis, as did, to a lesser extent, the final aria, ‘Ich freue mich auf meinen Tod’. Here I was rather taken with the swift tempo, which engendered something of a spirit of defiance. Jordan seemed very much to have rethought ‘traditional’ approaches to Bruckner, but to rather more successful effect. Once past a rocky opening – devoid of mystery, and of much else too, not helped by an onslaught of coughing – we heard some fine playing indeed from the young players of the GMYO: first strings, then the oboe soloist, and so on. The first movement was taken pretty fast, but not unrelievedly so. Intriguingly pointillistic woodwind matched well string pizzicato playing, and added to a sense of provisionality; this was no ‘cathedral in sound’ of cliché. There was, moreover, a strong sense of development: necessary here to avoid a sense of mere repetition. And there was a sense of intimacy too: not the constraint of the Bach performance, but something penetrating deeper, to the very essence of the musical lines. The moment of return was duly awe-inspiring: what a wonderful orchestra this is! Was the approach too fragmentary, though? Perhaps, perhaps not. It was certainly interesting. There was no wanting of power in the coda. The scherzo opened with a lightness that was far from non-committal, more Mendelssohnian perhaps. Response thereto was anything but light, although one could certainly hear Bruckner as an heir to Schubert (his Ninth Symphony in particular). Perhaps it was a little too driven, but it was certainly not dull. There was occasional insecurity concerning pulse, though. The trio was full of incident, proving both urgent and, occasionally, a little languorous. I liked its range. The finale developed the sense of late Romantic hypertension. There was nothing comfortable to this view of Bruckner, which was all to the good. Both the virtues and the drawbacks of the previous movements endured. Jordan proved, however, especially able in highlighting the contrasting nature in the musical material. Moments of crisis registered; much, it seemed, was at stake. The close was blissful, Schubertian. Never having heard Herbert Blomstedt live, I rushed to buy a ticket for this Prom as soon as tickets went on sale. The Leipzig Gewandhaus Orchestra was not an unattractive proposition either, of course. András Schiff: well, whatever has happened to him…? Before coming to Schiff’s contribution, though, I should say something about the Leonore 2 Overture. Try as I might, I cannot hear it ‘in itself’; I hear it almost as a sketch for no.3, fascinated, but unable to hear what might be preferable in it. Insofar as direction can be afforded it, Blomstedt certainly did. The Gewandhaus Orchestra immediately announced itself with deliciously dark string tone – ‘old German’, if ever there were such a thing – and equally outstanding solo woodwind. Digressions were given time to speak, and sounded less digressive than they usually would. My reception of Schiff’s performance in the Fifth Piano Concerto was not unique, but it certainly did not seem to be shared by the greater part of the audience, which roared with approval. What I heard in Schiff’s first entry was what I heard more or less the whole way through: something that somehow married pedantry to mannerism, incapable of evenness in passagework (or at least unwilling to play evenly), either unphrased or with phrasing that was bizarrely unmusical, and peppered with equally unmotivated articulation. He did not seem to listen to the orchestra, with whom he fell out of sync more than once, leaving Blomstedt to put things right, and indeed seemed utterly (and undeservedly) self-regarding throughout. The orchestra sounded splendid on its own terms, and Blomstedt proved a sure enough guide, insofar as he could, although I found his handling of the first movement’s tutti passages a little foursquare at times. The slow movement started better; indeed, it almost sounded recognisable; it was not long, though, before Schiff’s perversities set in again. The finale offered more of the same, a terrible pity, given that the orchestra’s playing exhibited all the virtues it had in the overture. His piano, it seems, was a Bösendorfer; maybe so, but it did not sound like one. Is it perhaps the case that he is now more at home on period instruments? A recent Schubert disc sounded far more successful than his recent work with modern pianos. And, although strangely flashy, the Schubert encore (Impomptu, D 899/2) was considerably more convincing. With just the orchestra and Blomstedt, the performance of the Seventh Symphony proved much more successful. The first movement introduction sounded full of tonal possibility, a worthy successor to Haydn. Orchestral clarity and tonal depth were revealed to be two sides of the same coin, the one enhancing the other. If I have heard more exciting transitions to the exposition proper, this was eminently musical, a proper continuation. Blomstedt’s way was not the knife-edge approach of Carlos Kleiber; indeed, it proved more Apollonian than Dionysian throughout the symphony. If it were not necessarily the way I think of the work, it was a perfectly valid alternative, from which much could be learned. The slow movement – yes, I know it is not a slow movement really, but it annoys the right people to call it that – was taken swiftly, and indeed almost without a break. That ‘following on’ intrigued, and proved highly successful; if only the bronchial brigade had been listening. A processional that might have fascinated Birtwistle ensued: played pretty ‘straight’, but certainly none the worse for that. The depth of string tone – depth, not necessarily volume – was truly a thing of wonder, but there was nothing narcissistic about this: all was at the service of the music, as the cliché goes. Blomstedt took the scherzo very fast indeed; I am not sure I have heard it faster, although doubtless some ‘authenticist’ will have managed to cross the line in half the time, having ‘discovered’ that Beethoven’s dog had eaten his metronome. Or something. If I missed the darker urgency, the sense that the future of the world was at stake, one would hear from, say, Daniel Barenboim, there was no doubting the accomplishment of the playing; and, as I said, it is a good thing to hear alternatives, so long as they are not unutterably perverse. I found the lack of relaxation for the trio a pity – one does not have to go to the lengths of a Leonard Bernstein here to feel that some such response is helpful, even necessary – and felt puzzled by a subsequent ultra-slowing for the transition back to the scherzo the second time around, but it made me listen. The finale worked uncommonly well, I thought. Too often, it comes to sound harsh, inhumanly driven: what could be less Beethovenian? Here, though, it proved almost graceful. Lower strings and timpani proved ample harmonic grounding, whilst above, the dancing continued. What seems to be a genuinely sunny disposition on Blomstedt’s part displayed itself also in the encore, the Egmont Overture. Not at the beginning, of course, in which the Gewandhaus Orchestra sounded still darker than it had earlier; perhaps more to the point, each note in that extraordinary introduction was invested with meaning. Here we moved closer to a ‘traditional’ reading. The rejoicing that followed returned us, howeverm to that earlier Apollonian disposition. And what playing we heard from the orchestra: to match any in the world! Thomas Larcher’s Second Symphony (written 2015-16) here received its United Kingdom premiere, its first performance having been given by the Vienna Philharmonic and Semyon Bychkov in June this year. A commission from the Austrian National Bank for its bicentenary, it is nevertheless not a celebratory work, instead commemorating those refugees who have met their deaths in the Mediterranean Sea, ‘expressing grief over those who have died and outrage at the misanthropy at home in Austria and elsewhere’. Larcher does not consider it a piece of programme music, though, and there seems no reason to doubt him. Or, to put it another way, if we can consider Strauss’s Alpine Symphony, the third work on the night’s programme, as a symphony, there is no reason why we should not this. It certainly felt like a symphony, not just on account of its four movements, but also their character and their relationship to one another. The first movement opened with a sense of pent-up energy being released, in very fast, highly rhythmic music, that material alternating with slower passages, in which tension is maintained, perhaps even increased, by various means including bass pedals. Without being ‘process music’, musical processes were very much to the fore, both, it seemed in the work, and in the excellent performance from the BBC Symphony Orchestra and Bychkov. Distorted – and sometimes not distorted – tonalities mapped out its space; they were not, perhaps, without nostalgia, but a nostalgia that did not shade into pastiche. A huge orchestral cry of agony – it was difficult not to think of the opening Adagio to Mahler’s Tenth Symphony, both with respect to similarity and difference – made its point, whether ‘programmatic’ or not. Henze, coincidentally or otherwise, sometimes came to mind too. A final descent left us wondering into what we were descending. The chorale-like opening to the succeeding Adagio inevitably brought Austro-German tradition once again to mind; for this really did feel like something akin to a ‘traditional’ slow movement, with a ‘traditional’ symphonic dialectic. Accordion and wind were often prominent, there seeming something to be fundamental about their timbres to the work. Vibraphone and piano duetting also caught the ear’s attention, likewise percussion more generally (as indeed in the first movement). Scalic movement in both directions was a particular concern too. The third movement sounded not entirely unlike a post-Brahmsian scherzo, with a touch of Stravinskian rhythmic insistence (although not always). The strange repetition of a chord – heard 140 times, apparently! – paradoxically seemed to increase tension, as much as any increase in volume and/or tempo. Then, at the end, a strange little Austrian dance fragment (a Ländler?) suggested neo-Mahlerian affinity to and alienation from Nature. The slow introduction to the finale seemed both connected to and yet something that had moved on from the world of the slow movement. Chorale music again soon flowered. The fast ‘main’ section showed an analogous (perhaps) affinity with the first movement. Again, it proved highly rhythmical and especially concerned with musical process; perhaps even the material itself was similar. In essence, this was a ‘traditional’ moto perpetuo, which then dissolved into a slow coda, which clearly spoke of sadness, shading into desolation. Apparent resolution (disconcertingly close, to my ears, to the world of Arvo Pärt, bells and all) was, mercifully, questioned at the last. Having spent the previous week or so in Bayreuth, I had the opportunity with the Wesendonck-Lieder, here in Felix Mottl’s familiar orchestration, to begin to ween myself off Wagner for a little while. There is nothing wrong with Mottl’s version, but I could not help wishing that Henze’s had instead been chosen; on the other hand, Mottl’s intimations of Strauss had their own logic in this particular context. Making her Proms debut, Elisabeth Kulman, always an admirable artist, proved a fine choice as soloist: the ‘instrumental’ quality to her voice adding, in a typically Wagnerian dialectic, to the blend of words and music. ‘Der Engel’, opening, sounded very much as a Lied, as it should, even if one with undeniable ‘operatic’ connections. Tristan und Isolde was inescapably close at times, but not repressively so. Kulman’s word-led approach here and elsewhere reminded us of Wagner’s priorities here (not so in Tristan, of course). The angelic, almost Straussian quality to the orchestra was judged to perfection by Bychkov and his players. 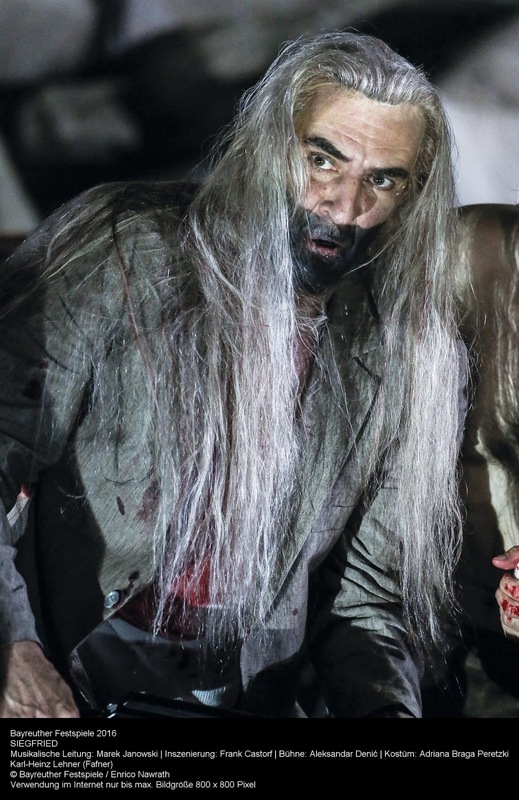 ‘Stehe still!’ had a different character: more dramatic, with vocal delivery taking us closer to the world of Die Walküre, never more so than in the first half of the final stanza, eye drinking blissfully from eye, and so forth. (Think of Wotan and Brünnhilde, if you will.) Bychkov took his time, quite rightly, and the conclusion proved properly radiant. ‘Im Treibhaus’ took us to Tristan-land proper, yet still with an element of distance; this is a song with its own concerns, not an excerpt. Kulman’s vocal colouring proved just the thing, very much with its own instrumental quality, as mentioned above. There was some especially wonderful viola playing – both solo and as a section – to enjoy too, likewise woodwind playing of Tristan-esque malevolence. ‘Schmerzen’ had a not un-Straussian autumnal glow to it, albeit on a smaller scale. Finally, ‘Träume’ returned us from autumn to a summer evening, its opening pregnant with Tristan-esque possibility, disciplined by the words and their implied structuring capability. Balm and eroticism proved two sides of the same Wagnerian coin. Strauss’s giant symphonic poem had the second half to itself. Bychkov’s reading flowed beautifully, sometimes quickly indeed; at the same time, he was not remotely afraid to hold back where necessary. If the opening sections were perhaps a little too closely defined in themselves, that should not be exaggerated. The Night in which the work opens was clear, directed: no lazy murkiness here. The BBC SO’s strings sounded voluptuous indeed as our journey gathered pace. Off-stage, Tannhäuser-plus horns thrilled: not just ‘materially’, but with a Nietzschean sense that that materiality might also too be spiritual. This is a symphony, after all, for the Anti-Christ. The forest proved darkly inviting, Bychkov alert to the detail of its beauties, without ever lapsing into pedantry. A post-Mozartian grace to the meadows was especially welcome, offering both contrast to and context for the Zarathustra-like grandeur and ambiguity to the greatest climax of all. As darkness began to fall, before the storm itself, tension could be felt, just as, or almost as, in ‘real life’. So too could the force of the storm, albeit with the detachment of an audience member rather than an actual participant. It was, inevitably, though the Epilogue (Karajan once claimed to conduct the work for this alone) that brought tears to the eyes, exquisite woodwind playing an especial joy. It lingered, as it must: never quite enough, for Strauss is just as sure a dramatist here as in his operas. After which, the darkness into which his world was falling, as is ours.